Grade 1 winner and multiple graded stakes sire Bodacious Dash has been purchased by Bobby Simmons. DEMING, NM—FEBRUARY 2, 2019—Bodacious Dash SI 101, a graded stakes siring son of all-time leading sire First Down Dash has been purchased by Bobby Simmons and will stand the 2019 breeding season at Born Running Ranch in Deming, New Mexico. His fee will remain $2,500. Bred by Bob and Jerry Gaston and raced by Johnny Trotter, Grade 1 winner Bodacious Dash won or placed in 13 of 16 career starts while earning $756,496 in two seasons at the track. He won the Grade 1 Texas Classic Futurity, was second in the Rainbow Derby(G1) and third in the Championship at Sunland Park(G1). The sorrel stallion also qualified for the Rainbow Futurity(G1), Dash For Cash Futurity(G1) and John Deere Stakes. From a limited number of starters in five crops to reach racing age, Bodacious Dash is the sire of 38 winners, 9 black type, earnings of over $1.2 million and average earnings per starter in excess of $10,800. In his first crop he sired an All American Futurity finalist. His top performers include Sky Bo Dash SI 103 (4 wins to 4, $242,072 Remington Championship Challenge-G2, etc. 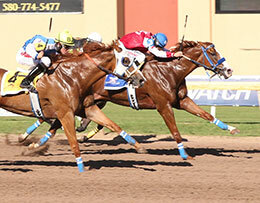 ), Suenos Dineros SI 101 (3 wins to 4, $157,123 West Texas Futurity-G2, etc. 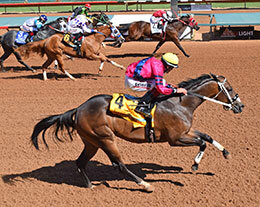 ), Em Bodacious Chick SI 97 (winner at 2, $59,660 Ruidoso Juvenile S., etc. ), Silver Jet Dash SI 104 (5 wins to 3, $43,944 Intermountain Futurity, etc. ), B D Illusion SI 91 (2 wins to 4, $34,604 2nd Mr Jess Perry S.), Bo Dash Back SI 95 (3 wins to 4, $34,050 3rd Long Beach H., etc. ), Bodaciouscandywagon SI 91 (2 wins at 2, $32,849 2nd Fair Meadows Juvenile S., etc. ), Dashin By All SI 102 (3 wins to 4, $29,861 2nd Alberta Bred Derby, etc. ), etc. Bodacious Dash's sire, world champion First Down Dash SI 105 ($857,256), is the all-time leading sire of everything with 256 stakes winners, 36 champions and earners of more than $88.1 million. Known as a "Sire of Sires", his top performers include 4-time AQHA Racing Champion Ocean Runaway SI 105 ($1,642,498, Champion of Champions-G1, etc. 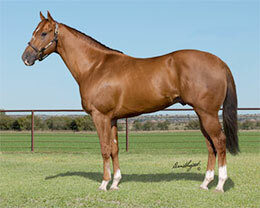 ), 5-time AQHA Racing Champion Corona Cash SI 101 ($1,542,880, All American Futurity-G1, etc. 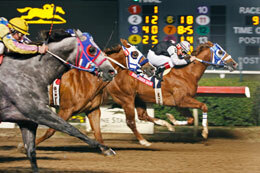 ), 3-time AQHA Racing Champion Corona Kool SI 104 ($1,296,797, Los Alamitos Million Futurity-G1, etc. ), two-time champion and world champion sire FDD Dynasty SI 102 ($1,173,001, Ed Burke Million Futurity-G1, etc. ), etc. Bodacious Dash is out of the restricted grade 2 winning Mr Jess Perry mare St Pats Tea SI 109 ($95,791), dam of 14 winners, 17 ROM, 3 black type including Grade 1 winner Bodacious Dash SI 101 (see above), Charger Bar Handicap(G2) winner Native Tea Rose SI 90 ($260,905), Firecracker Derby(G2) winner St Pats First SI 08 ($173,113), Sam Houston Futurity(G1) finalist First Tea Rose SI 91 ($33,744), etc. St Pats Tea is the granddam of stakes winners Rock That Wagon SI 99 ($124,399) and Rob That Wagon SI 03 (6 wins in 8 starts at 2, 2018 $77,243), etc. The second dam Shes My Tea SI 92, a sister to stakes winner Lotta Tea SI 94 ($49,422), is the dam of 4 ROM, 3 winners, from 5 foals. She is the granddam of restricted grade 2 winner Mon Ti Rose SI 103 ($284,169), stakes winner and track record holder Mon Ti Soli SI 111 ($81,107), restricted grade 1-placed Get Cash Now SI 101 ($143,271), stakes-placed All American Derby(G1) finalist Mon Ti Dash SI 96 ($123,094), etc. For additional information or breeding contracts call Sarah Donaldson-Rioux at (575) 494-6424.